High in magnesium, raw, and sprouted. A crunchy creamy nut with floral honey and delicate cinnamon. 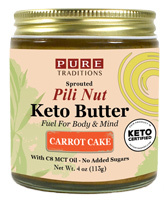 Pili Pushers’ nutrient-rich pili nuts are hand-harvested from pili trees that grow wild on volcanic soil. Their high Vitamin E and Magnesium content help combat stress and free radicals, boost energy and maintain heart health. To enhance and preserve their vitamins and living enzymes, they are soaked in water then slowly dried at low temperatures. Our uniquely crafted process allows you to enjoy that crisp yet deliciously creamy texture of this superfood. Unlike our other pili nuts, these are a bit higher in carbs due to the added honey, but are really tasty and perfect when you are looking for a guiltless dessert-like snack.